Seneca products express the warmth of the human hand. By utilizing historic beehive kilns and old glaze recipes, trained craftsmen create beautiful handcrafted tiles. As a manufacturer, Seneca is the largest producer of authentically handmade tiles in the United States, and a recognized leader in manufacturing rustic, glazed tiles and unglazed paver tiles. As an importer, Seneca offers the finest examples of unique ceramic tile products from around the world. Some of the kilns Seneca uses today were originally used by the St. Stephen Tile Company founded in 1906 to manufacture clay field tile. These tiles were used to drain the surrounding rich farm land. This heritage was the inspiration to turn the historic kilns and traditional techniques to the task of creating Seneca Handmold and Quarry Paver tiles. 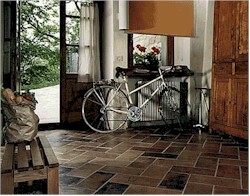 The kilns are often used to impart the timeless look to these remarkable tiles. At the left, craftsmen beat clay into wooden molds. These methods were abandoned by other tile makers in exchange for mass production techniques.